Objective To consider the research gaps related to the environmental impacts of electronic cigarettes due to their manufacture, use and disposal. Methods Literature searches were conducted through December 2013. Studies were included in this review if they related to the environmental impacts of e-cigarettes. Results Scientific information on the environmental impacts of e-cigarette manufacturing, use and disposal is very limited. No studies formally evaluated the environmental impacts of the manufacturing process or disposal of components, including batteries. Four studies evaluated potential exposure to secondhand e-cigarette aerosol, an indication of impacts on indoor air quality. A 2010 survey of six e-cigarette models found that none of the products provided disposal instructions for spent cartridges containing nicotine. Notably, some e-cigarette manufacturers claim their e-cigarettes are ‘eco-friendly’ or ‘green’, despite the lack of any supporting data or environmental impact studies. Some authors argue that such advertising may boost sales and increase e-cigarette appeal, especially among adolescents. Conclusions Little is known about the environmental impacts of e-cigarettes, and a number of topics could be further elucidated by additional investigation. These topics include potential environmental impacts related to manufacturing, use and disposal. The environmental impacts of e-cigarette manufacturing will depend upon factory size and the nicotine extracting method used. The environmental impacts of e-cigarette use will include chemical and aerosol exposure in the indoor environment. The environmental impacts of disposal of e-cigarette cartridges (which contain residual nicotine) and disposal of e-cigarettes (which contain batteries) represent yet another environmental concern. The impact of electronic cigarettes (e-cigarettes) on the public health includes consequences for the environment such as air quality effects, energy and materials used, issues related to environmentally responsible disposal and land use decisions. An environmental impact analysis of e-cigarettes will ensure that regulators, manufacturers and the public are aware of the possible current and future environmental implications associated with the manufacturing, use and disposal of e-cigarettes. Literature searches were conducted to evaluate the current understanding of the impact of e-cigarettes on the environment. Scientific information on the environmental impacts of e-cigarette manufacturing, use and disposal is very limited. No studies formally evaluated the environmental impacts of the manufacturing process or disposal of components, including batteries; however, there is potential that ‘eco-friendly’ claims might be used as a marketing strategy. Accordingly, the environmental impacts of e-cigarettes require further investigation. 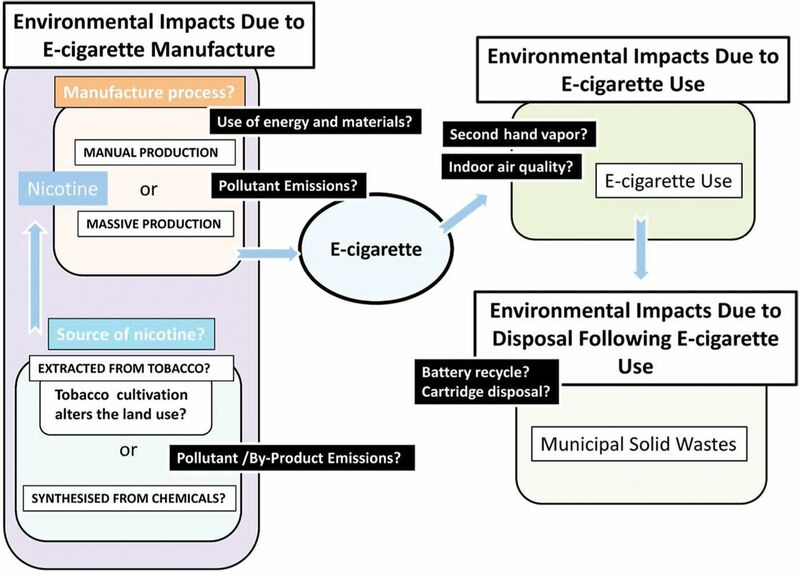 Figure 1 illustrates the potential environmental impacts of e-cigarettes, including those related to manufacturing, use and disposal; potential environmental impacts and associated research needs are discussed in detail below. Potential environmental impacts associated with e-cigarettes. Systematic literature searches were conducted through December 2013 to identify research related to e-cigarettes and their environmental impacts. Five reference databases (Web of Knowledge, PubMed, SciFinder, Embase and EBSCOhost) were searched using a set of relevant search terms used singly or in combination. Search terms included the following: ‘electronic nicotine devices’ OR ‘electronic nicotine device’ OR ‘electronic nicotine delivery systems’ OR ‘electronic nicotine delivery system’ OR ‘electronic cigarettes’ OR ‘electronic cigarette’ OR ‘e-cigarettes’ OR ‘e-cigarette’ OR ‘e-cig’ OR ‘e-cigs’ OR ‘environment’ OR ‘environmental impact’ OR ‘nicotine purification’ OR ‘tobacco extraction’ OR ‘indoor air quality’ OR ‘indoor air pollution’. To be considered for inclusion, the article had to (1) be written in English; (2) be publicly available; (3) be published in a peer-reviewed journal; and (4) deal partly or exclusively with e-cigarettes and their environmental impacts. The search yielded approximately 170 articles that met the inclusion criteria. Article titles and abstracts (when titles provided insufficient detail) were then screened for relevance. This yielded 18 articles and 3 news releases for full-text review, which included a manual search of the reference lists of selected articles to identify additional relevant publications. No studies specifically evaluated the environmental impacts of e-cigarette manufacturing; issues related to use of resources, assembly, nicotine source, tobacco cultivation and global production, along with associated research needs, are described below. Although e-cigarette design varies by manufacturers, an e-cigarette generally contains a battery, an atomiser and a cartridge.1 Typically, the cartridge is wrapped in a plastic bag. Manufacturing the e-cigarette components requires the use of energy and materials; for example, the battery contains metals and heavy metals; energy-consuming processes are required in order for the metals to be obtained or reclaimed. Furthermore, whether e-cigarettes are classified as ‘disposable’ or ‘non-disposable’, the service lifetime of each e-cigarette component is not measured in years but rather in weeks, based on at least one internet posting from a vendor.2 Therefore, e-cigarettes are consumable products, just as cigarettes and other tobacco products. It is not clear, for the typical e-cigarette user, how many cigarettes would be equivalent to the use of one e-cigarette. It is also uncertain how the energy and materials used for manufacturing compare if e-cigarettes and traditional cigarettes are evaluated based on consumption: stated alternatively, assuming that a user would consume one e-cigarette to provide a nicotine amount equivalent to 10 traditional cigarettes, it is unclear whether the manufacturing of that one e-cigarette would use less energy and materials than the manufacturing of 10 cigarettes. An analysis that models the use of energy and materials required to manufacture each component of e-cigarettes may reveal whether more or less energy is required to provide the equivalent amount of nicotine compared with traditional cigarettes for an average cigarette user. E-cigarettes may be manually assembled in small factories by a handful of employees, or they may be manufactured in assembly lines on a much larger scale. Larger factories will generate greater emissions to the adjacent environment, and therefore will have a greater environmental effect. When an e-cigarette manufacturer meets Toxics Release Inventory (TRI) Program criteriai established by the US Environmental Protection Agency (EPA), it must annually report to EPA its nicotine, lead, ammonia and other pollutant emissions to the water, the land and the air.3 However, EPA does not require facilities that do not meet TRI Program criteria to submit emission information; therefore, individual and cumulative e-cigarette pollutant emission information from all manufacturing sites may not be collectable. Information about the e-cigarette manufacturing process and the size distribution of manufacturing facilities would inform an analysis of the environmental impacts of substances released into the environment during manufacturing. The liquid in e-cigarettes (commonly referred to as ‘e-liquid’ or ‘e-juice’) is formulated to contain a mixture of chemicals, including nicotine in some products. Nicotine used for e-cigarettes can be chemically extracted from tobacco plants or tobacco dust.4 ,5 However, it is not certain if nicotine contained in the e-liquid is formulated using US Pharmacopoeia-grade (USP-grade) nicotine or tobacco extract as the source of nicotine6 or if it is synthetic nicotine. Furthermore, when tobacco extract is used to provide the nicotine content of the e-liquid, the process of extraction generates spent tobacco that potentially contains nicotine and other harmful constituents. It is not clear how the spent tobacco is disposed of or if the spent tobacco is reused for other purposes, such as compost or animal feed. Purification of USP-grade nicotine from tobacco extract or tobacco dust can be accomplished using aqueous ion exchange, a process that may require a large amount of water4; furthermore, a great amount of energy may be used to remove the water. To avoid using a large amount of water, certain anhydrous nicotine purification methods have been developed.5 However, these methods use non-aqueous halogenated compounds and generate halogenated waste; such methods may present other environmental issues, particularly the energy used to manufacture the halogenated compounds and disposal of the halogenated compound waste, if it is not properly controlled. In addition to extracting nicotine from a natural source, scientists have developed methods to chemically synthesise nicotine. For example, there is a US patent for a method to chemically synthesise nicotine with the potential for use in industrial production of nicotine.7 The chemical synthesis method uses organic solvents including formaldehyde, formic acid and dichloromethane. The intermediate product is purified by high vacuum distillation, which suggests that the waste is emitted to the atmosphere. The final nicotine product is obtained by further reaction with formaldehyde and formic acid, resulting in more emissions to the atmosphere. It is uncertain which source of nicotine would be selected and which methods would be used by the industry. Nevertheless, the emissions would be substantial in an industrial scale setting if not properly controlled. As nicotine is the key component in e-liquid, the environmental impacts associated with obtaining nicotine would inform an analysis of one of the major environmental impacts of e-cigarettes. An understanding of industrial nicotine manufacturing methods and the associated emissions on an industrial scale is vital in order to evaluate the environmental impacts of e-cigarettes. As discussed, nicotine can be extracted from tobacco, an agricultural product, and then purified. Assuming that the majority of nicotine used for e-cigarettes is extracted from tobacco plants, the demand for tobacco crops could potentially increase as a result of e-cigarette marketing, which would present a potential alteration in land use. According to a press release from the Wall Street Journal Market Watch, Virginia Tobacco Company, a subsidiary of Universal Corporation, the leading global leaf tobacco supplier, has joined Avoca, one of the world's premier botanical extraction companies, to form AmeriNic, which will produce liquid nicotine for the e-cigarette industry.8 At present, no evidence suggests that this merger would result in any increase in the use of tobacco crops. A survey of land area currently used to support production of nicotine and an estimation of the efficiency of nicotine yield from tobacco would assist in identifying the potential land conversion resulting from e-cigarette marketing. A large proportion of e-cigarettes in the US market are imported; furthermore, certain components and ingredients of domestically produced e-cigarettes are manufactured abroad. For example, purified nicotine might be manufactured in India, while the disposable e-cigarettes might be manufactured in China. A comprehensive environmental analysis requires an understanding of the global impacts due to marketing of imported e-cigarettes or e-cigarette components in the USA. A global analysis of purified nicotine and e-cigarette manufacturing locations would inform an analysis of the environmental impacts of the manufacturing of e-cigarettes that are imported by and sold in the USA. E-cigarette use is a potential source of chemical and aerosol exposure in the indoor environment. Because the health impact of secondhand aerosol exposure is unknown, WHO has recommended restricting the use of e-cigarettes in public spaces, similar to that of cigarettes.9 E-cigarettes contribute secondhand aerosol to the environment only by emitting particles as they are exhaled by the users (unlike secondhand smoke from conventional cigarettes, which also includes side-stream smoke along with the particles exhaled by smokers). Four studies have evaluated potential exposure to secondhand e-cigarette aerosol, an indication of impact on indoor air quality. A series of studies conducted by Schripp et al10 evaluated the potential exposure to secondhand aerosol that can result from e-cigarettes. The studies described by Schripp et al evaluated the release of volatile organic compounds (VOCs) and fine/ultrafine particles from e-cigarettes using an 8 m3 emission test chamber. In one experiment, a volunteer was asked to use three different e-liquids (apple flavoured without nicotine, apple flavoured with nicotine, and ‘tobacco flavoured’ with nicotine) and one conventional cigarette. The air in the chamber was collected before and after e-cigarette use to identify the components released. In a second experiment, VOCs in exhaled breath were measured after a volunteer was asked to exhale one e-cigarette puff into a 10-litre glass chamber. These experimental designs mimic secondhand aerosol exposure. Major components identified in the gas phase included 1,2-propanediol, 1,2,3-propanetriol, diacetin, flavourings and traces of nicotine. In a third experiment, aerosol was transferred from the e-cigarette into a 10-litre glass chamber using a pump to produce a slight underpressure that then transferred the aerosol directly into the chamber. Measurements were conducted using three types of e-cigarettes, all of which included the same e-liquid. This study showed ‘shrinking’ of aerosol in a 10-litre glass chamber at 37°C when the aerosol was passed directly from the mouthpiece of an e-cigarette into the glass chamber, instead of being exhaled by the volunteer. McAuley et al11 report on a study conducted using a smoking machine to test VOCs, carbonyls, nicotine, polycyclic aromatic hydrocarbons and tobacco-specific nitrosamines emitted from e-cigarettes in comparison with traditional cigarettes under equivalent experimental conditions. However, the study may present issues of cross-contamination with cigarette smoke, as noted by Burstyn.12 Furthermore, the experiment was conducted using a smoking machine rather than human exhalation. It is not clear how the exhalation, which is then released to the indoor climate, might affect the aerosol, considering the humidity and air circulation factors that are not present in a study with a smoking machine. Czogala et al13 evaluated the release of nicotine, particulate matter with diameter ≤2.5 μm (PM2.5), Carbon Monoxide (CO) and VOCs generated by a smoking machine or exhaled by users in a conventionally ventilated, full-sized room. This room was a 39 m3 emission test chamber equipped with a regulated exhaust ventilation system and two fans for mixing the indoor air. The chamber had plain acrylic painted walls and a tiled floor, with no windows, carpets, linings or curtains inside. The authors used three different models of e-cigarettes selected from the popular brands in Poland and they used two ventilation settings. The air in the chamber was collected before and after e-cigarette use to identify the chemical components released. In one study, the authors used the smoke machine to simulate two scenarios, that of low exposure through secondhand aerosol (with some nicotine absorbed by the user) and high exposure through secondhand aerosol (with no nicotine absorbed by the user). In another study, the volunteers exhaled secondhand aerosol after use in the chamber. Both studies showed that e-cigarettes are a source of secondhand exposure to nicotine but not to CO and VOC, as the amount of CO emitted was as much as that in the background and only toluene was detected after e-cigarette use. Secondhand exposure to PM2.5 was also detected. Schober et al14 evaluated the release of PM, particle number concentrations, VOCs, polycyclic aromatic hydrocarbons, carbonyls and metals exhaled by e-cigarette users in a ventilated room that contained three tables and a wardrobe (café-like setting) in an office building. The authors used three different e-liquids with or without the addition of nicotine. They found that the e-liquids contained >90% of the humectants 1,2-propanediol and glycerine. They also found that nicotine levels were on average 22% above the manufacturer's declaration of 18 mg/mL, but liquids labelled as nicotine-free had no nicotine present. All e-cigarette solutions contained small amounts of sensitising chemicals including benzyl alcohol, menthol and vanillin. They found none of the tobacco-specific nitrosamines (eg, N-nitrosonornicotine, N-nitrosoanatabine, N-nitrosoanabasine and 4-(methylnitrosamino)-1-(3-pyridyl)-1-butanone) in the e-liquids. The air in the chamber was collected before and after e-cigarette use to identify the components released. In one study, volunteers exhaled secondhand aerosol sitting around tables in the chamber. That study showed that the amount of PM, 1,2-propanediol, glycerine and nicotine was higher on the vaping days than on the control day. No significant difference was found for formaldehyde, benzene and the pyrolysis products acrolein and acetone when compared with the background concentrations. There was one exception out of the six vaping sessions where the level of formaldehyde was higher than on the control day. Indoor concentrations of the sensitising chemicals vanillin and benzyl alcohol were only slightly increased in comparison with control values. Indoor concentrations of CO and CO2 showed no difference between control and vaping days. A study evaluating the indoor air quality in other various locations (eg, car, home, office, school and public indoor areas such as transit stations) during and after e-cigarette use would provide important information about environmental impacts. This information should be collected using a representative sample of the e-cigarette products currently available. No studies have formally evaluated the environmental impacts of the disposal of e-cigarette components, including batteries. However, one study of six products noted that none included disposal instructions. Trichounian and Talbot surveyed the design and labelling of six models of e-cigarettes and reported none of them indicated a proper way to dispose of parts of the e-cigarettes, including the cartridge, batteries and atomisers.1 The authors noted that the amount of e-liquid left in the spent cartridges varied. To estimate the amount of nicotine in 300 puffs from an e-cigarette, Goniewicz found that the amount of nicotine left in the spent cartridges of six e-cigarette brands sold in the UK on the internet varied from 19% to 90% (samples were taken from one to two batches of each brand).15 When a pharmaceutical product with nicotine as the sole active ingredient (eg, nicotine patches, gum and lozenges) is discarded without being used for its intended purpose, it is classified as a Resource Conservation and Recovery Act (RCRA) hazardous substance.16 However, a discarded used product is not included under RCRA. E-cigarettes are not a pharmaceutical product; therefore, the disposal of e-cigarettes is not regulated under RCRA or any other programme. This means that the unused and the used cartridges containing residual nicotine can be disposed of without treatment to remove nicotine. Although some manufacturers have initiated recycling programmes for their e-cigarette cartridges, the prevalence of recycling for these cartridges is unknown. E-cigarettes contain batteries. Some manufactures have also initiated recycling programmes for their e-cigarette batteries. The prevalence of recycling instructions on disposable e-cigarette packages, as well as how frequently disposable e-cigarettes are recycled, is unknown. Heavy metals may be released if disposable e-cigarettes are disposed of in landfills. Furthermore, if the used disposable e-cigarettes are collected and crushed to reclaim the batteries, without proper treatment nicotine residue will enter the environment. A survey investigating disposal behaviour after use, a model estimating release of heavy metals from e-cigarette disposal and an analysis of the amount of residual nicotine remaining in the cartridge after a typical use would contribute to an environmental impact analysis of e-cigarette disposal. When products are labelled ‘green’, the products have a greater potential to sell. A survey of 1305 small businesses nationwide conducted in 2012 revealed a significant increase in sales of ‘green’ products. For example, organic food sales have increased by 238% in the past 10 years, whereas the non-organic food market has only increased by 33%.20 Similarly, a ‘green’-labelled e-cigarette may potentially sell better in the market compared with conventional cigarettes and e-cigarettes that are not labelled as ‘green’. Furthermore, Yamin et al21 noted the potential that adolescents could be misled by ‘eco-friendly’ e-cigarettes and be tempted to use e-cigarettes. What energy and materials are required to manufacture each component of e-cigarettes? Is more or less energy required to manufacture one e-cigarette when it is compared with the manufacture of the number of conventional cigarettes that provides the equivalent amount of nicotine for an average cigarette user? What is the e-cigarette manufacturing process in an industrial setting? What are the facility sizes of the various e-cigarette manufacturers? How is nicotine extracted, purified or synthesised in an industrial setting? How does indoor air quality change during and after e-cigarette use? Are disposable e-cigarettes disposed of as hazardous waste, are they recycled or are they disposed of as regular trash? How much of the land in the USA and abroad supports the cultivation of tobacco that is used for the extraction and purification of nicotine? This article summarises the limited published information related to the environmental impacts associated with e-cigarette manufacturing, use and disposal. Four studies have evaluated exposure to secondhand e-cigarette aerosol, an indicator of indoor air quality. Two were conducted under conditions that might reflect indoor room or café settings. More research is needed to evaluate the exposure in a variety of real-world circumstances. Research gaps related to e-cigarette environmental effects include, but are not limited to, estimates of energy and materials used in the manufacturing process, impact of various nicotine extraction and processing methods, impact on indoor air quality and issues related to disposal of e-cigarette components, including batteries and cartridges. MyVaporStoreTM. http://www.myvaporstore.com/Atomizers_E_Cigarette_s/23.htm (acessed 26 Nov 2013). US Environmental Protection Agency. Toxics Release Inventory (TRI) Program. 24 October 2013. http://www2.epa.gov/toxics-release-inventory-tri-program (accessed 27 Nov 2013).
. Recovery of nicotine from aqueous extracts of tobacco wastes by an H+-form strong-acid ion exchanger. Ind Eng Chem Res 1998;37:4783–91. , inventor; Rohm and Haas Company, applicant. Anhydrous Purification of Nicotine Using an Ion Exchange Resin. European Patent EP1176143 A1. 30 January 2002. http://www.google.com/patents/EP1176143A1 (accessed 26 Nov 2013). , inventor; Global Vapor Trademarks, Inc., assignee. Method for Preparing Tobacco Extract for Electronic Smoking Devices. United States Patent US 20120145170 A1. 14 January 2012. http://patft.uspto.gov/netacgi/nph-Parser?Sect1=PTO2&Sect2=HITOFF&p=1&u=%2Fnetahtml%2FPTO%2Fsearch-bool.html&r=1&f=G&l=50&co1=AND&d=PTXT&s1=%22tobacco+extract%22.TI.&OS=TTL/"tobacco+extract"&RS=TTL/"tobacco+extract" (accessed 26 Nov 2013). ., inventors; Divi's Laboratories Limited, assignee. Process for the Preparation of (R,S)-Nicotine. United States Patent US20120209006 A1. 16 August 2012. http://www.google.com/patents/US20120209006 (accessed 24 Oct 2013). Wall Street Journal Market Watch. Universal Corporation Announces Joint Venture to Produce Liquid Nicotine. Press release. 6 August 2013. http://www.marketwatch.com/story/universal-corporation-announces-joint-venture-to-produce-liquid-nicotine-2013-08-06 (accessed 24 Oct 2013). World Health Organization Framework Convention on Tobacco Control. 2013. http://www.who.int/fctc/en/ (accessed 26 Nov 2013).
. Comparison of the effects of e-cigarette vapor and cigarette smoke on indoor air quality. Inhal Toxicol 2010; 24:850–7.
. Peering through the mist: what does the chemistry of contaminants in electronic cigarettes tell us about health risk? Philadelphia, PA: Drexel University School of Public Health, Department of Environmental and Occupational Health, 2013. http://publichealth.drexel.edu/SiteData/docs/ms08/f90349264250e603/ms08.pdf (accessed 23 Oct 2013).
. Nicotine content of electronic cigarettes, its release in vapour and its consistency across batches: regulatory implications. Addiction 2014;109:500–7. State of Washington. Pharmaceutical waste. Specific waste: nicotine. Olympia, WA: State of Washington Department of Ecology, 2013. http://www.ecy.wa.gov/programs/hwtr/pharmaceuticals/pages/nicotine.html (accessed 23 Oct 2013). PR Newswire. ProSmoke Electronic Cigarettes Now the First and Only Company in the Industry with Green America Certification. 29 October 2012. http://www.prnewswire.com/news-releases/176324091.html (accessed 27 Nov 2013). PR Newswire. Only One Electronic Cigarette Company Approved for Green Certification. 19 April 2013. http://www.prnewswire.com/news-releases/only-one-electronic-cigarette-company-approved-for-green-certification-203809191.html (accessed 27 Nov 2013). Green Business Bureau. 2011. http://www.gbb.org/ (accessed 26 Nov 2013).
. Study shows green business practices lead to higher sales. Phoenix Business Journal. 11 January 2013. http://www.bizjournals.com/phoenix/news/2013/06/11/study-shows-green-business-practices.html?page=all (accessed 26 Nov 2013). Contributors HC conducted the literature search, reviewed abstracts and composed this paper. She is the guarantor. ▸ The facility manufactures (defined to include importing), processes or otherwise uses any Emergency Planning and Community Right-to-Know Act (EPCRA) Section 313 chemical in quantities greater than the established threshold in the course of a calendar year.